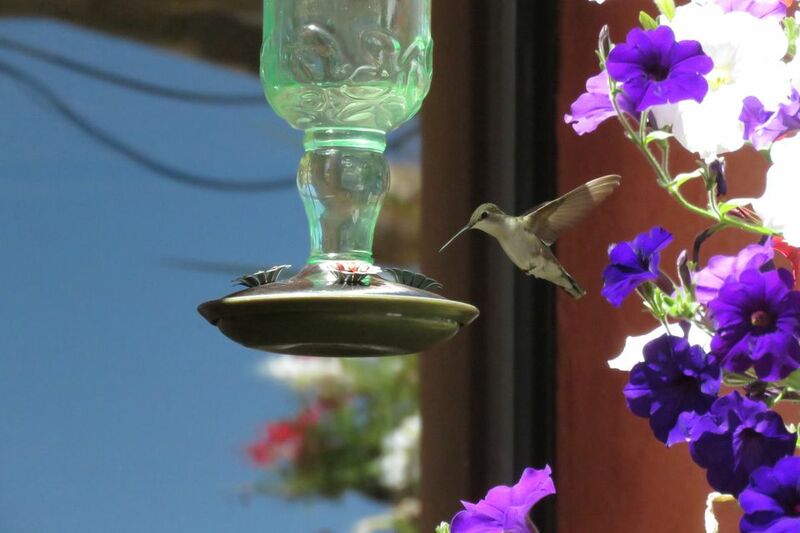 Hummingbird feeders are magnets for these flying jewels. Putting those feeders in the proper place will not only attract more hummingbirds but will do so more safely and provide great views for watching every visitor. But where should hummingbird feeders be located for the best results? Experienced backyard birders know that moving a feeder to a new location, even just a few feet away, may make a difference about that feeder's popularity, and the same is true for hummingbird feeders. A poorly positioned feeder may leak and attract more insects or pests, the nectar may spoil more quickly or visiting hummers could be threatened by predators. Bad placement may also mean the feeder is less visible to birds or birders or less convenient for refilling and cleaning. By putting a hummingbird feeder in the right place, however, it can be a great garden accent, a reliable food source for hungry hummers and a joy for hummingbird lovers to watch. While every yard is different, there are certain factors that influence where to hang hummingbird feeders. Birders who take note of those factors will be able to better position their feeders to appeal to more hummingbirds. Convenient: Ideally, feeders must be convenient for birders to clean and refill. This means positioning a feeder within easy reach, not so high that it is difficult to take down. Putting feeders near decks, patios or paths rather than deep in garden beds will also make them more accessible. Safe: An unsafe hummingbird feeder can hurt birds, and feeders should always be hung high enough that cats or other predators will not be able to jump at feeding birds. The feeders should also be either very close to windows or far enough away that birds are able to avoid the glass rather than risk collisions. Private: Hummingbirds can be aggressive and territorial, and they will avoid feeding in areas where larger birds are active. Position hummingbird feeders away from other feeding stations, and distribute multiple feeders throughout the yard so aggressive hummers have their own spaces to defend and more birds can visit. Close: Closer hummingbird feeders offer better views for stunning observations and exceptional hummingbird photography. Choose feeder locations that are close to good viewing windows, outdoor benches or gazebos and don't have obstructions the birds will easily hide behind. Protected: While it is possible to minimize drips from hummingbird feeders, some leaks are bound to happen. Placing the feeder in an area protected from strong winds will help keep it from tipping, and the feeder should be set away from high traffic areas where it might get accidentally bumped. Protecting the feeder from the rain will also help keep nectar fresh and uncontaminated. Shaded: Nectar can spoil quickly on hot summer days, and if the feeder is in full sunlight all day long, it may not be suitable for hummingbirds for more than a day or two. Position the feeder in an area that gets afternoon shade to protect it from the hottest temperatures. Dappled shade under a tree is also better than full sunlight, and will still catch birds' attention. Well-Spaced: Hummingbirds frequently hover while feeding, and if a feeder is nestled into dense foliage, the birds will not have enough space to maneuver comfortably around the feeder. These birds also prefer to be able to fly around the feeder in order to defend it from other birds. When all factors are considered, there are some spots that are ideal for hummingbird feeders. In a hummingbird garden with plenty of nectar-rich blooms and abundant insects to provide protein for these birds' diet. On or near a kitchen or office window with exceptional views but where decals or other tactics to prevent bird window collisions are used. Hanging from a gutter, awning or gazebo where the feeder sparkles but is still shaded during the hottest part of the day. Within 10 to 12 feet of a protective cover that provides shelter and perches to give hummingbirds an easy, safe place to rest. Of course, anywhere is a good place to put a hummingbird feeder if there isn't already one in the yard. Knowing where to place that first feeder, however, as well as many others that will surely follow, can help bring more hummingbirds to the yard for years of amazing enjoyment.